I am a huge fan of oatmeal! I eat oats for breakfast every morning, and depending on my mood, I’ll eat it cold or warm. My favorite cold version of oatmeal, perfect for a warm summer morning in Texas, includes swiss oatmeal or overnight chocolatey oats. 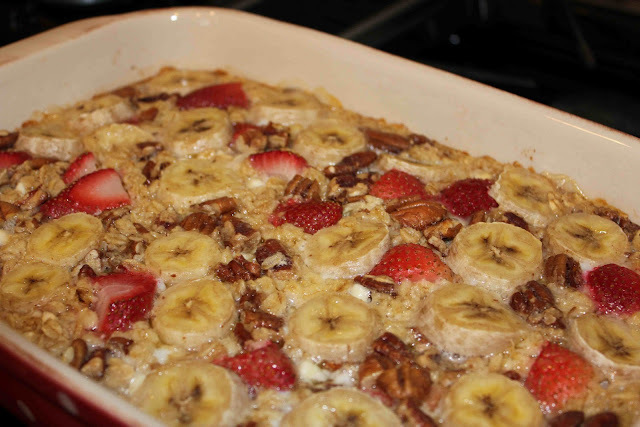 When I want pipping hot oatmeal, I opt for original baked oatmeal or a sweeter version: baked blueberry oatmeal. I substituted white chocolate chips for semi-sweet because I am not much of a chocolate fan for breakfast, thus I thought white chocolate would be less intense. Please use ground cinnamon for your spice. I used Chinese five spice, as the original recipe called for, but would recommend you use ground cinnamon instead. The Chinese five-spice blend was a little over-powering and too “spicy” for me. I substituted chopped pecans for walnuts. Either is fine…use whatever you have in your pantry. 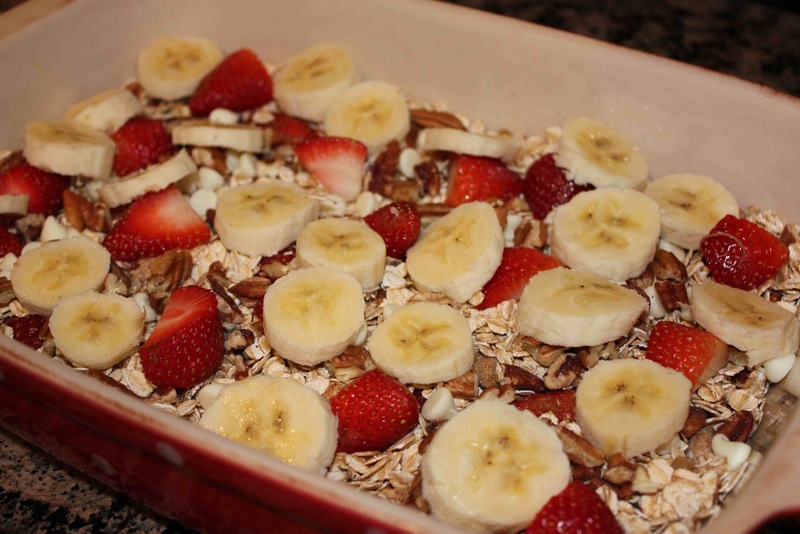 Overall, I thought this baked oatmeal was very good. I recommend sprinkling brown sugar on top, and returning the casserole to the oven to broil it and create that extra crunch! You can also drizzle maple syrup over the top for an added sweetness, but I didn’t feel it was necessary. My husband also really liked this. It’s always nice when he enjoys new recipes, especially “girly” and fruit-centered recipes that don’t involve red meat! Haha. 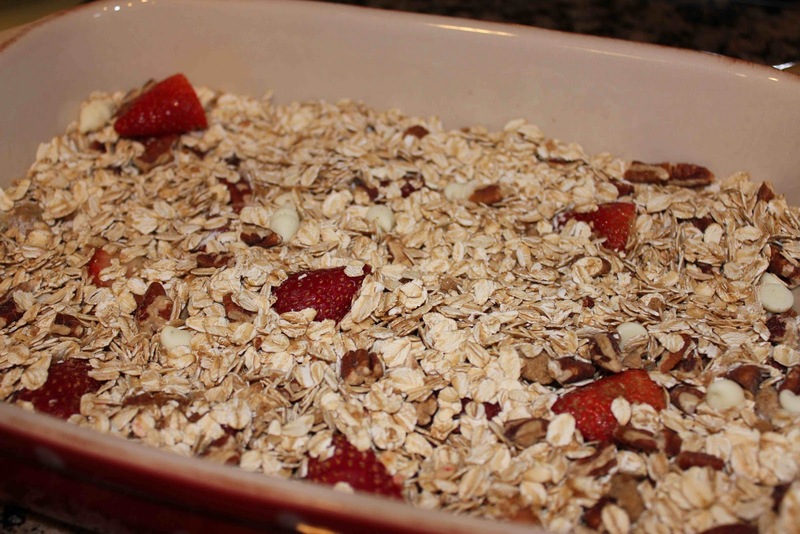 Combine oats, sugar, baking powder, orange zest, cinnamon, half the strawberries, half the nuts, and half the chocolate chips. 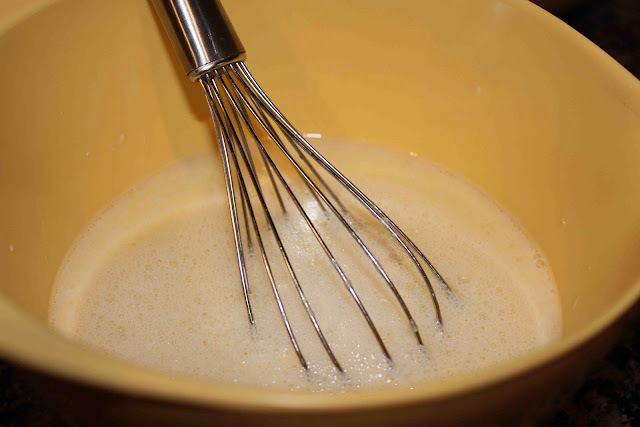 Whisk together the milk, egg, butter, and vanilla extract. Add the oat mixture to the prepared pan. 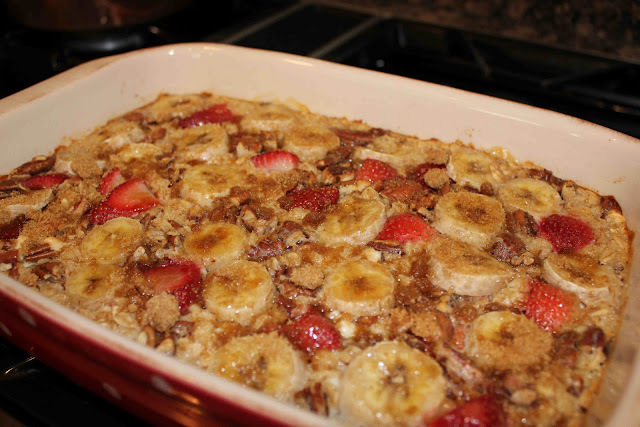 Top with remaining strawberries, bananas, and nuts. Pour the milk mixture over fruit and oat mixture. Bake for 35-40 minutes in a 375 degree oven. Sprinkle with brown sugar. Return to oven and broil for 20-30 seconds. 1. Preheat oven to 375 degrees F and generously spray the inside of a 10-1/2 by 7-inch baking dish with cooking spray and place on a baking sheet. 2. In a large bowl, mix together the oats, baking powder, orange zest, cinnamon, salt, half the strawberries, half the pecans and half the chocolate. 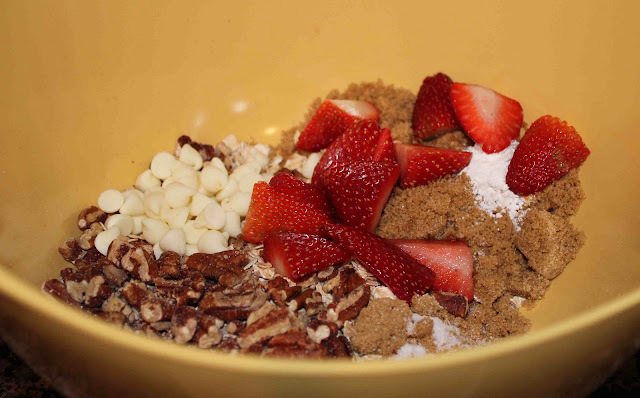 (Save the other half of strawberries, walnuts and chocolate for the top of oatmeal). 4. Add the oat mixture to prepared baking dish. Arrange the remaining strawberries, nuts and chocolate on top. Add the banana slices to the top then pour the milk mixture over everything. 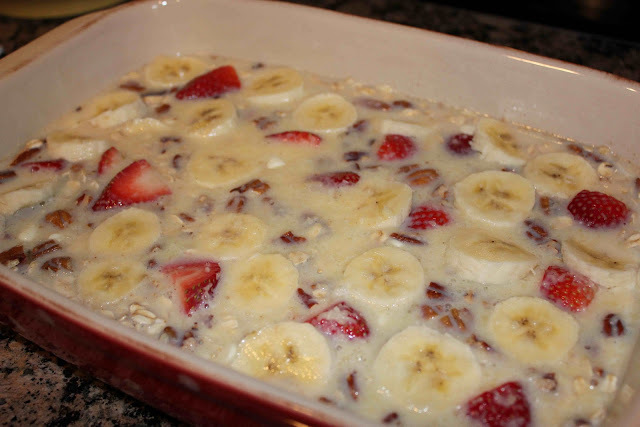 Gently shimmy/shake the baking dish to help the milk mixture go throughout the oats. 5. Bake 35 to 40 minutes or until top is nicely golden brown and the milk mixture has set. For an extra tasty top, sprinkle a tablespoon or so of extra brown sugar on top then place back in the oven under the broiler and broil for 20-30 seconds. Serve warm with an extra sprinkle of sugar or drizzle in maple syrup. 4 Responses to "Baked Oatmeal with Strawberries, Banana and White Chocolate"
That looks delicious. Having never baked oatmeal, what is the consistency? Is it more like an oatmeal cookie or a bowl of oatmeal? @Jenny – The consistency is like a cross between a granola bar and traditional oatmeal; NOT like a cookie. The oats are visible and do not disappear like they do in the traditional, creamy oatmeal. Hope you like it!